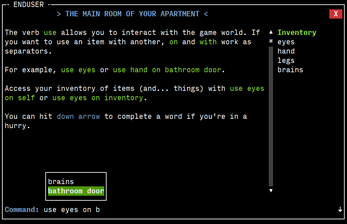 ENDUSER is a short text adventure about a person (you) living a day of their life. You wake up in your room with your stomach rumbling. You task is to stumble your way into tomorrow. "ENDUSER is well written, and its balance of humour, self loathing and a familiar-but-odd view of its world makes for a delightfully surreal experience." ENDUSER was written for Linux Game Jam 2018 with the theme of "Versatile Verbs" by a team of three Finns: Samsai, Tumocs and Tuubi. Initial engine, artwork (SFX, music, logo) and story by Tumocs. Coding and extra writing by Samsai and Tuubi. The "Rebotched Edition" improves upon the version that was released for the game jam by improving the parser with tab-completion and singular/plural aliases for certain words, fixes a number of bugs and introduces an all new, alternative terminal user interface based on an initial implementation by Ysblokje. Install Python 3 (at least 3.3) and (if running outside of Itch client) execute "run.sh" in your terminal to play. Dependencies for 32-bit and 64-bit Linux systems are bundled in the game archive, but if you don't get any audio, install PySDL2, SDL2 and SDL2-mixer. On Ubuntu installing python3-sdl2 should do the trick. The Windows port of the game is considered an experimental beta and has some features missing that are part of the Linux version. The Windows version of the game has all the dependencies, including Python, bundled together for ease of use. To run the game outside of the Itch client, run the "start_windows.bat" file. 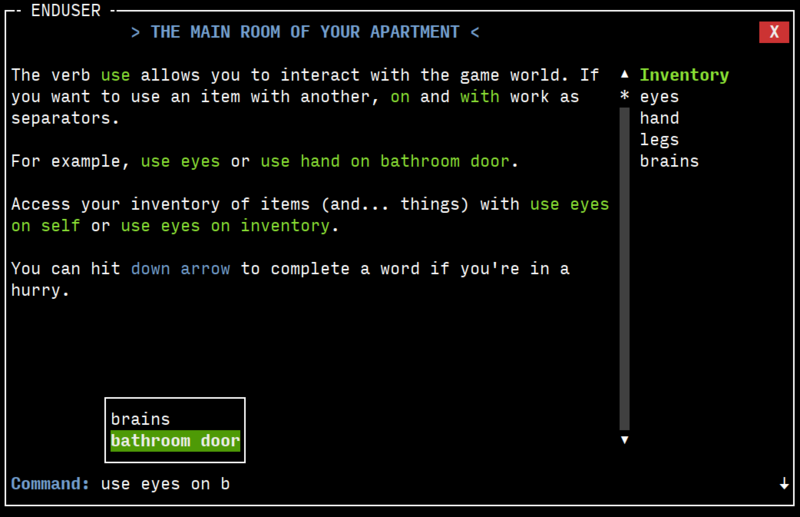 If running through the Itch client, install the game and click Play. You will be given the option of the default version and Classic. Default version uses the new terminal user-interface and the Classic uses the older command line interface. The Windows version does not support the TUI.